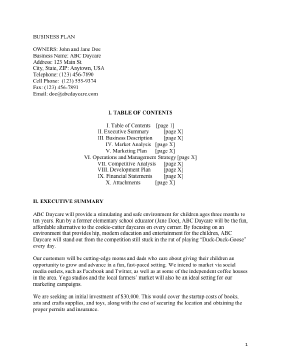 This Day Care Business Plan can serve as a starting point for your new business, or as you grow an existing enterprise. ABC Daycare will provide a stimulating and safe environment for children ages three months to ten years. Run by a former elementary school educator (Jane Doe), ABC Daycare will be the fun, affordable alternative to the cookie-cutter daycares on every corner. By focusing on an environment that provides hip, modern education and entertainment for the children, ABC Daycare will stand out from the competition still stuck in the rut of playing “Duck-Duck-Goose” every day. Our customers will be cutting-edge moms and dads who care about giving their children an opportunity to grow and advance in a fun, fast-paced setting. We intend to market via social media outlets, such as Facebook and Twitter, as well as at some of the independent coffee houses in the area. Yoga studios and the local farmers’ market will also be an ideal setting for our marketing campaigns. We are seeking an initial investment of $30,000. This would cover the startup costs of books, arts and crafts supplies, and toys, along with the cost of securing the location and obtaining the proper permits and insurance. The child provider industry is one that is always in high-demand, since people will always be procreating, and will always need someone to care for their children. We will providing that service to our clientele, in a small, intimate setting that is appealing to parents who have to separated from their children. No parent wants to think of his/her child being just one of the many in a crowd of children, none of whom gets the attention he/she deserves from the childcare provider.